Ways to Incorporate Greenery - Wedding Ideas. Whether your wedding has a fresh, organic flair or you’re trying to find a more budget-friendly floral option, there are several ways you incorporate greenery to give your day a refreshing touch. More and more couples are opting for greenery, like eucalyptus, ruscus, ferns, ivy and more - fostering inventive ways to bring the outside in. In warmer months, ferns are all around. By hanging a few oversized, plush ferns from a ceiling or beam, you can easily transform an interior space. 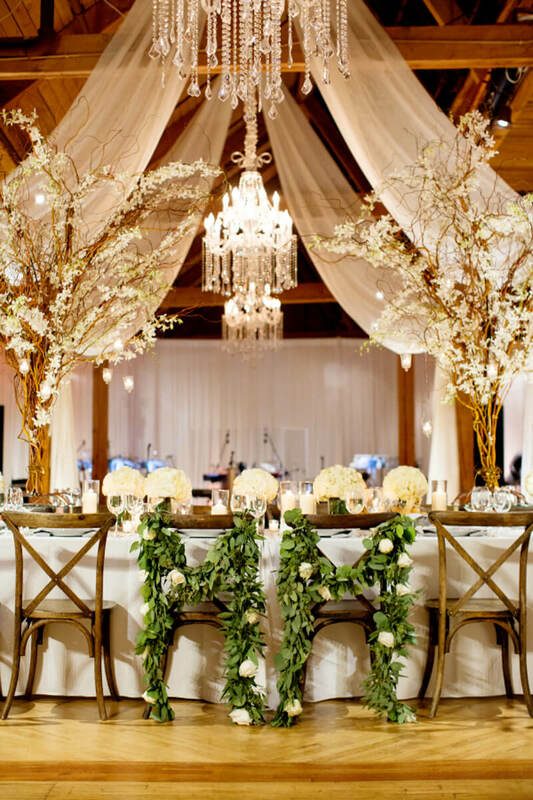 Chandeliers have always been a staple of many weddings, but chandeliers made of greenery are a new trend couples love. With ruscus dripping down from the chandelier and the incorporation of thin tapers, this arrangement exudes a light, romantic ambiance. 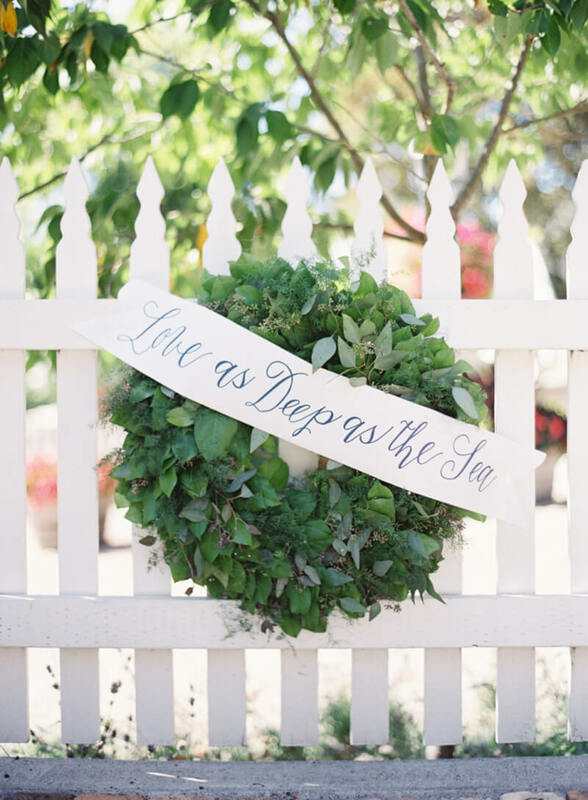 Wreaths are an easy way to dress up any door, venue or even getaway car! By asking your florist to make a simple wreath of greenery, it will make a standout appearance against any backdrop. Even your aisle can get a facelift with added greenery. 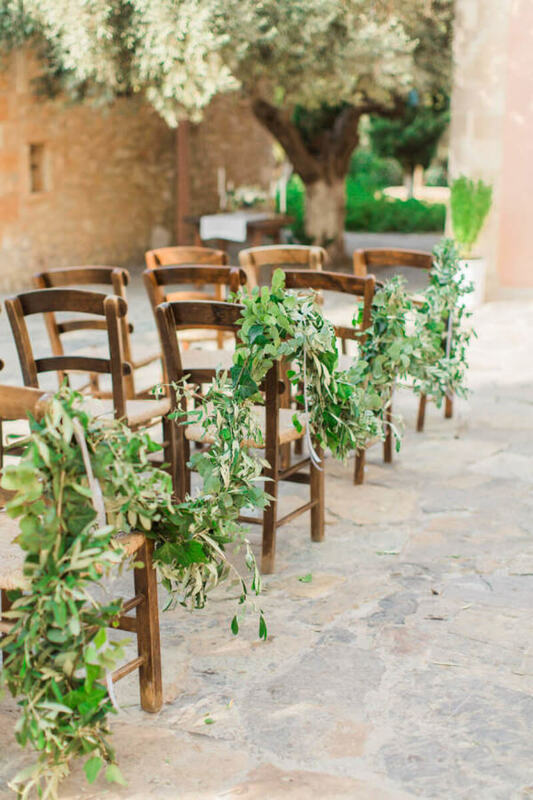 This aisle uses swags of greenery on the aisle-lined chairs to enhance the outdoor scene. With a ceremony set up around the venue’s enchanting fountain, greenery embellishes the back rows of seating, providing a perfect, fresh finish. If you want to add height, trees and topiaries are also a great way to incorporate fresh greenery into your reception space. Set against the perimeter of a white tent, these arrangements are a gorgeous addition. Instead of designing table runners made of fabric, candles or oversized florals, use greenery for a fresh pop of color. This runner, made with waxy magnolia leaves and dotted with a few flowers here and there, offers texture and color. This modern reception space has greenery from top to bottom. While greenery hangs from the ceiling, its refreshing appeal is mirrored with plush table runners that drip down to the floor. And if you just want a touch of greenery somewhere special, dressing up the chairs at your head table is the perfect way to show that those seats are indeed taken. The greenery floral trend is as popular as ever. Its appeal is far-reaching and the possibilities are endless. Chat with your florist about how you can get creative with your wedding day vision to infuse this refreshing style choice. Bastide Du Roy Wedding - Antibes, France.